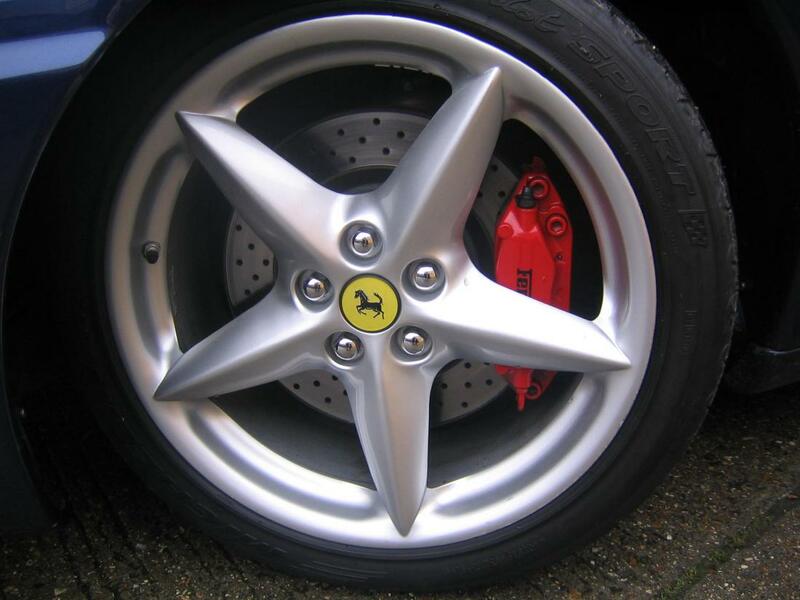 Leather headlining,Red callipers.Xenon headlightswith power wash,Daytona pattern,electric seats6xCD,space saver spare wheel,Scuderia enamel wing shields, battery charger.Challenge rear grille. 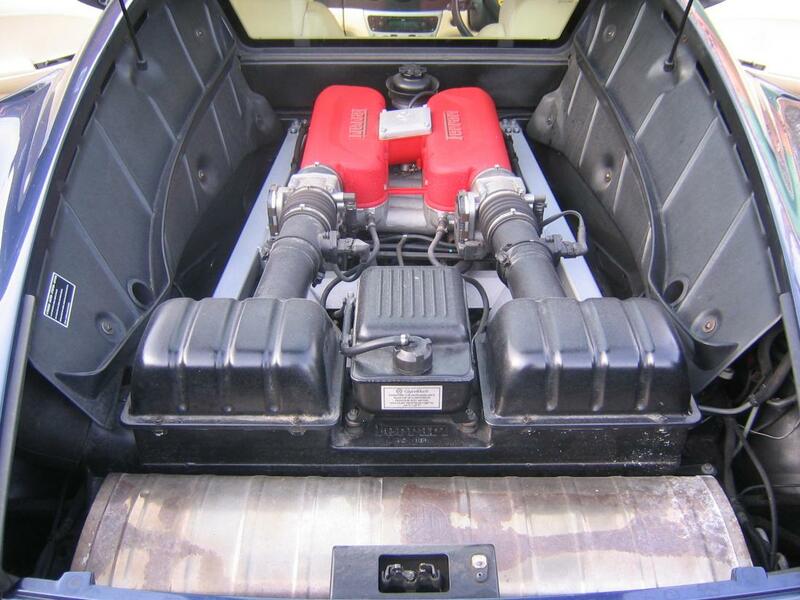 The car entered production on Thursday 1st June 2000 and was completed twelve days later on Tuesday the 13th June. 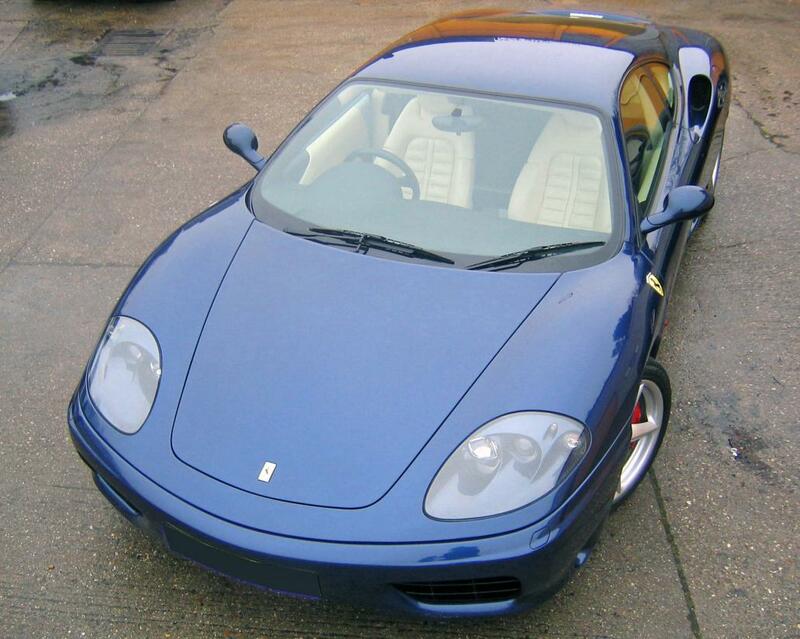 It was transported to Ferrari UK in Surrey -one of just 352 manual 360's-and in turn to the then Ferrari agents MHT in Gloucestershire. Delivered new and first registered W109 WAD on the 18th July 2000, by the MHT of Gloucestershire, to 33-year-old director, Mr Tim S of Lincoln.In addition to the then (1st April 1999) list price of £101,243.87(plus delivery, number plates and road tax) the car was optioned with Xenon headlamps and washers £1022.25, red brake callipers £399.50, Daytona” pattern seat inserts £1245.50, electric seats, £1245.50, space saver-spare wheel, £446.50, leather headlining £223.25,6xCD changer £716.75, battery charger £505.25 and Scuderia wing shields £669.75. It would appear the second, as yet unidentified owner, purchased the car circa January 2002 applying their registration number R4 DAR on the 21st February 2002. Purchased by the third owner Mr John W of Bangor, on (TBA). 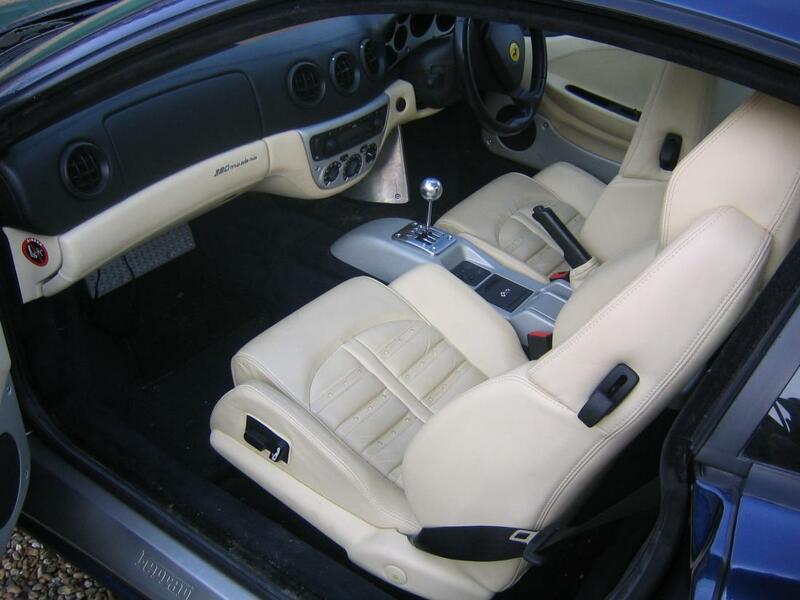 The penultimate owner Mr Robert B of Hampshire, purchased the car from Ferrari main dealers, Stratstone on the 1st May 2005 at 14,200 recorded miles. Following an independent road test and report by Steve Moody of SMDG, the car was purchased by the last owner Mr David M from Essex, on the 1st June 2007 at 22,749 recorded miles. During his ownership he has had a perforated Challenge rear grille fitted-not shown in photographs. Complete as new with factory service book, handbooks, wallet and tools. 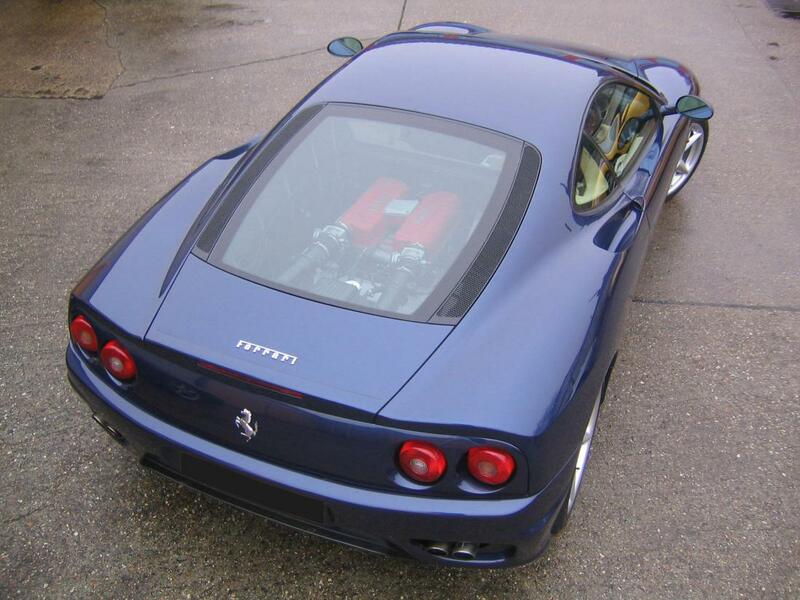 This very highly optioned car is finished in arguably one of the best colour combinations for a 360 Modena. The model was available in right or left hand drive form, with power assisted steering as standard. The standard road wheels were stylised versions of the traditional five spoke “star” alloy design, featuring slim ridged convex spokes and five bolt fixing with 18&#8243; diameter rims, 7.5&#8243; wide at the front and 10&#8243; wide at the rear. Independent suspension was provided all round with front and rear anti roll bars, the one at the rear running within the chassis frame. The suspension and braking systems were fitted with a Bosch 5.3 ABS/ASR system very similar in concept to that used on the concurrent 550 Maranello. This provided either “normal” or “sport” mode, or could be switched off completely, dependant upon the driver’s wishes. The gearbox was available with standard manual control via the traditional lever in the open gate, or an upgraded and more sophisticated version of the “F1&#8243; system introduced on the F355 model, with “up” and “down” gear change paddles mounted on the steering column. One of the advances of the revised system was that on sensing an input from the driver on either paddle, the throttle opening was adjusted accordingly during the change process to automatically smooth out the gear change.